Our firm serves personal injury clients. We are also a law firm for California health care fraud whistleblowers, teaming with brave individuals/groups to combat fraud. Why the overlap? 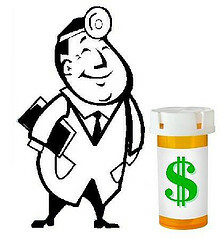 In a press release announcing the settlement of pharmaceutical kickback claims, Assistant Attorney General Stuart F. Delery explains that “Americans who rely on federal health care programs, particularly vulnerable patients in skilled nursing facilities, are entitled to feel confident that decisions about their medical care are not tainted by improper financial arrangements.” Such tainted decisions can cause serious harm to patient health and even death. Combatting health care fraud and representing the injured serve similar goals, making the practices a natural fit. The Department of Justice (“DOJ”) published the press release referenced above in February 2014. It announced a settlement with Omnicare Inc., the nation’s largest company supplying pharmaceuticals and related services to nursing homes and long-term care facilities. Omnicare agreed to pay the government $4.19 million to settle claims Omnicare solicited and received kickbacks from Amgen Inc., a drug manufacturer, for participating in “therapeutic interchange programs” aimed at switching Medicaid beneficiaries from another drug to one of Amgen’s products. Kickbacks included rebates, grants, data and speaker fees, consulting services, as well as dining and travel. The settlement resolved claims filed via the False Claims Act’s (“FCA”) qui tam provisions which allow a private whistleblower (“the realtor”) to bring claims under the Act. Pursuant to statutory formulas, the Amgen/Omnicare realtor received $327,925 of the settlement for his role in reporting the fraud and assisting in the prosecution. Another press release dated June 25, 2014, detailed Omnicare’s agreement to pay $124.24 million to settle separate kickback allegations (note: Omnicare is also involved in other kickback cases), with $8.24 million going to states that helped fund impacted Medicaid programs. Per the government’s claims, Omnicare provided improper discounts to nursing facilities in exchange for their agreement to use Omnicare as their pharmacy provider. The facilities were Medicare and Medicaid participating providers and Omnicare submitted claims to Medicare and Medicaid for the medications supplied to the facilities. DOJ officials noted that this type of scheme takes advantage of the elderly facility residents. Omnicare’s alleged acts would induce facilities to choose their pharmacy provider based on improper discounts to the facility, rather than proper considerations including quality, service, and cost to home residents (largely Medicare and/or Medicaid subscribers). The supposed scheme violates the Anti-Kickback Statute by providing or offering remuneration (including discounts) to induce referrals of Medicare- or Medicaid-covered services or supplies. The law seeks to ensure such choices are made in the patient’s best interests and not tainted by improper financial incentives for the companies/individuals involved. In agreeing to the settlement, Omnicare resolved two lawsuits brought under the FCA’s qui tam provisions. Donald Gales, a former Omnicare employee, was the first whistleblower and he will receive $17.24 million for his role in identifying and prosecuting the fraud. Omnicare has also been involved in other kickback-related allegations and settlements. Why Fight Health Care Fraud? Fraud on the government and more specifically on the healthcare system drains critical resources, raises already high healthcare costs, and causes direct harm by taking the focus off health and putting money over patient care. Kickback schemes are a prime example of this risky mix of priorities. The same fundamental beliefs that motivate our injury practice also motivate our work fighting violations of the federal False Claims Act and related laws. If you have information pointing to fraud on our state or federal health care systems, call to schedule a free consultation with our California health care fraud attorney. Together we can fight fraud while ensuring you are protected against retaliation and receive any amounts you are due for your brave involvement in this fight.